This section focuses on a how to hook rugs for people just starting out. The rug above is my very first project. I went off to a meeting of the Nova Scotia Rug Hooking Guild at the Tatamagouche Centre and Marion Kennedy sold me a kit and and taught me how to hook rugs. As I was hooking, she pointed out some mistakes I was making and I asked her, “Should I pull it out and start again?” She said, “Don’t do that you will learn as you go along. Finish it, that’s your job, finish it.” With less than three square inches of the rug hooked this seemed like a dauntingly job but it wasn’t. It turned out that as I kept at it , I learned as I went along. 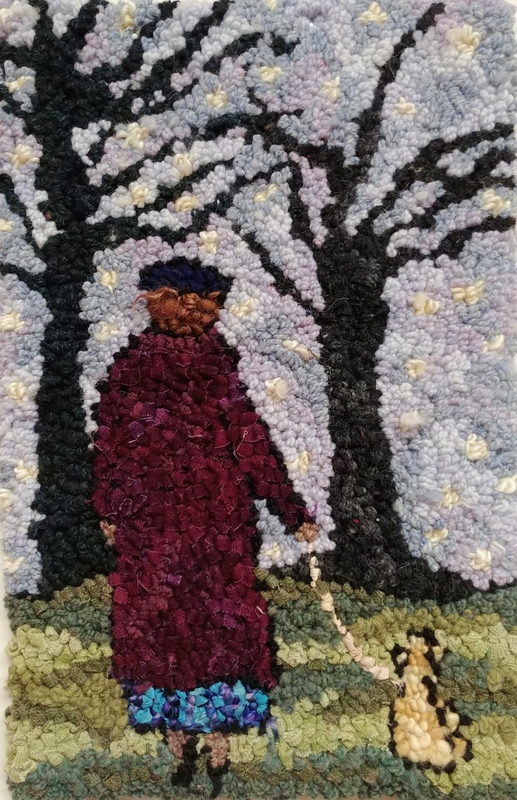 I kept her voice in my head, “finish the mat” and I finished this first project with in a week, and quickly moved on to design my next rug.